When “Ran” was released in 1985 many cinephiles as well as critics thought it would be the swan song of director Akira Kurosawa, after a career which had spanned over 40 years starting with the first film of his in 1943. The Japanese had helped to put Japan on the map internationally in terms of cinema with classics such as “The Seven Samurai”, “Rashomon”, “Stray Dog” and “Kagemusha”. With “Ran” it was clear, considering the age of the filmmaker, that his career had probably reached its end, which was only emphasized by the fact that although “Ran” was praised by critics worldwide it made very little money. However, it was his dream which made Kurosawa go back to the medium he had mastered so many times in the past. Ever since he heard about the dream journal of famous Russian writer Fyodor Dostoyevsky, he kept such a journal for himself which he wrote in regularly. He describes a number of recurring dreams which he had over the years, about his fears for his home country Japan as well as his own youth and childhood. While he was not able to find anyone of the Japanese studios willing to finance his film, eventually with the help of American director Steven Spielberg, who helped in convincing Warner Brothers to produce it, the movie was ready to go into production. The movie is split into eight dreams which revolve around a boy, late man called “I”. As a boy (Toshihiko Nakano), he witnesses a fox wedding during a summer rain, an event his mother (Mitsuko Baisho) warned him about. At home, he must face the consequence of his actions. 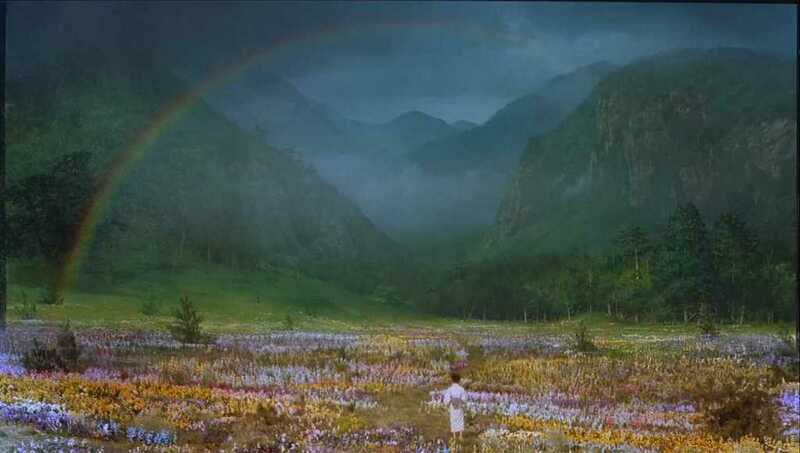 In the second dream he (now played by Mitsunori Isaki) is confronted with the deforestation of his beloved peach orchard, a place the young always went to for its beauty. Later on, as he grows into a young man (Akira Terao) he is part of a group of mountaineers and then a soldier coming home after most of his comrades have fallen during the battles of World War II. He begins to discover the arts and meets the artist Theo van Gogh (Martin Scorsese) who tells about his drive as an artist, to capture nature. As he grows up, he must face the apocalypse due to several nuclear meltdowns as well as the aftermath, when Japan is occupied by demons. In the last dream he comes across a village with many water mills and talks to an old man (Chishu Ryu) telling him about the secret of this place, why its people seem to be so happy and how they make a living without any modern appliances. There are many topics within the dreams connecting them, apart from the fact they have the same protagonist as already mentioned. Many of the dreams deal with the loss of innocence, not only of “I” but also of Japan as the setting of the film. While the protagonist is very early on faced with death and destruction (especially of nature) which later continues with his trauma caused by the senseless deaths of his comrades during war Japan loses, its innocence as well as the colors of the first dreams start to fade turning into dark tones in the later episodes until everything is wiped out during the nuclear explosions and their aftermath. This might lead to one of the reasons why it was so difficult for Kurosawa to find the money for his picture since, especially the sixth dream titled “Mount Fuji in Red”, which is highly critical of Japan embracing nuclear technology. After the war, this seems to be the doom for the country as well as its people, with the toxic red gas approaching which contains plutonium as one of the last surviving humans (Hishashi Igawa) tells two others before he jumps from a cliff into a quicker death. Japan, as shown in the film, has long gone and its only choice is to find a way back before it’s too late. One of these places of necessary regression and harmony is nature which is both a place of beauty as well as mystery in the world of “Dreams”. Humanity needs to find its way to live in harmony with nature, as suggested by the old man in the final dream of the film, or else nature will eventually outlive humans trying to re-set the balance in the end. Approaching nature can be dangerous as evident in the first dream when the human and the natural sphere collide for a moment, leading to the child having to atone for his sins in front of the foxes he witnessed. Art, as Martin Scorsese in his role as van Gogh tells “I”, can be a way to approach nature, its beauty serving as an unfailing source of inspiration for the artist who “devours” the natural setting. The crows in the sky, in the painting “WheatField With Crows”, however, also hint at a certain dark undertone to this vision as this relationship to nature can also devour the artist, so it seems, or which can be interpreted as a pessimist prophecy for what nature might have in store for humanity given its uneven relationship. “Dreams” is a film which lives and breathes through its impressive use of color and landscape. As he has done so many times before, especially in works such as “Ran”, beautiful wide angle shots show nature in its entire beauty, a sight which is overwhelming at times for the observer. While in “Ran” the setting for the many battle scenes, here it seems more peaceful – until it erupts in the sixth dream leaving the world in a desolate state with demons roaming the deserted ash fields of what once was a country. It is an idyllic setting, nature with its forest and rivers, one which is in no need for technology, which, in the end, only speeds up the process of humanity’s demise. It is a very didactic approach the director has chosen, but one which he expresses full of conviction. In conclusion, “Dreams” is a beautiful and sometimes disturbing film about the relationship between humanity and nature as well as about a boy growing up, finding his way in life and exploring its possibilities. Using the logic of dreams, each one of the episodes ends rather abruptly like waking up (sometimes from a nightmare which one would rather forget as soon as possible). It is a very personal film for its director, one with a message for its viewer which – considering the alternative he offers – sounds a bit naïve, too utopian to be precise, especially for someone who has explored the human condition in his work for most of his life. Leaving the didactic approach aside for a moment “Dreams” is a moving film about loss, about the past as a collection of events, or dreams to be precise, which have defined one as a person, one’s work and attitudes. It is also a tale about time not spent, not used fully, regret about lives being lost for absurd causes like war and nuclear power and about people trying to find their homes in the rubble of what once was a village or a farm. But it is also a celebration of life as the characters of the last dream sing and dance on their way through the forest, now seemingly at peace with the equally beautiful nature surrounding them.